Many of you didn’t want to take the risk to write iOS applications based on monotouch because of the Apple iOS 4 license agreement, now it changes, today Apple announced to “relax all restrictions on the development tools used to create iOS apps, as long as the resulting apps do not download any code”. In other words start development your iOS applications and make some money. Apple you provide a new reviewer guidelines, explaining what is allowed and what is not before you start build applications. 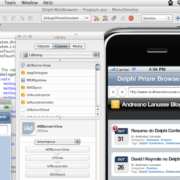 That’s a great news, days ago I published an article about iPhone development take a look. Do you have a link to the actual license wording? Me registrei essa semana no programa de desenvolvedor Apple. No contrato on-line na área de membros já existe a nova cláusula falando sobre isso. Aquela pergunta que fiz a ti recentemente está mais que respondida agora. E é uma excelente notícia para toda a comunidade, minha opinião. Apple will release a new reviewer guideline explain what you can and can’t do. But is clear the restriction about download any code is related with flash IMO. The restriction not to download code has some exceptions with web-based technologies. The developer agreement can be seen when you sign up. The reason is obviously that if you download code, Apple can’t control content and safety. – Many of Delphi’s offsprings (apart from the main Win32 product) have been discontinued in the past. I still have some code running in Delphi.Net, some others might have experienced the same with Kylix, C++ Builder X etc etc. – Apple changes license agreements at will all the time. Is it really safe to hope they won’t change their opinion again? They might condone a Mono app for now, but they don’t welcome it. – What if Microsoft starts having a more aggressive stance against Mono? One of those is enough and you end up with a product that you can’t build or distribute anymore. As I have said…interesting technological combinations (I love bridging previously incompatible systems and tool chains), but it seems too fragile to me.